The Mount Rushmore is a memorial that honors four historical presidents that changed the United States history. The Super Bowl is the biggest sporting event in the world and often lives up to the hype. These four games mentioned below are the Mount Rushmore of Super Bowls, with the most historical and memorable games included (since 2000). In chronological order, I put the four Super Bowls that have had the best endings, as well as historical meaning. The “Greatest Show on Turf” featured Kurt Warner going for his second Super Bowl win, Torry Holt, Isaac Bruce, Marshall Faulk, and Hall of Fame offensive lineman Orlando Pace taking on second year QB Tom Brady with the 6th-ranked defense that season. Even though the Rams had 427 yards of offense compared to the Patriots 267, three costly turnovers had the Rams down 17-3 entering the 4th quarter. The Rams came back to tie it up 17-17 with 1:30 left. 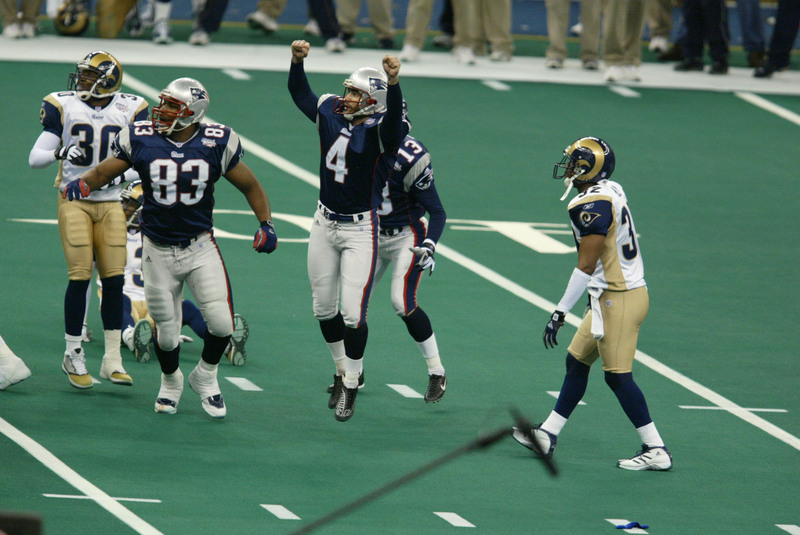 Brady’s offense drove 53 yards to set up a 48-yard field goal for Vinatieri to win the game as time expired, making it the first Super Bowl to have a winning play as time expired. It also set up the Patriots’ dynasty with five more Super Bowl wins. Tom Brady won his first of four Super Bowl MVPs, as he and coach Bill Belichick have returned for eight more Super Bowls. Kurt Warner returned for one more Super Bowl with the Cardinals, and the Rams returned to lose again in Super Bowl 53 to New England again (as Los Angeles). Ram’s fans will remember the “Greatest Show on Turf” coming up short while Patriot’s fans will look at back at this game as the beginning of the dynasty for Brady and Bill. Coming in with a record of 18-0, the New England Patriots were loaded with a star-powered team in Tom Brady, Randy Moss, Wes Walker, Vince Wilfork, Richard Seymour, Tedy Bruschi, Rodney Harrison, and Minnesota Gopher great, Laurence Maroney. The Giants looked like underdogs entering the playoffs with a 10-6 record, having to win three road games to get to the Super Bowl. While only having one Pro Bowler in Osi Umenyiora (which is the lowest ever for a Super Bowl team), they also had future Hall of Famers Michael Strahan and Justin Tucker all on the defensive line and Eli Manning running the offense. The Giants played tough, only down 7-3 entering the 4th quarter. Eli Manning threw a five-yard pass to David Tyree to take the lead 10-7. With 2:42 remaining on the clock, Tom Brady threw a six-yard touchdown pass to Randy Moss to take the lead 14-10 and it seemed like the Patriots were going to go 19-0, completing a perfect season. Eli Manning and the Giant’s offense had other plans. With 1:15 remaining and the Giants facing 3rd & 5, one of the most iconic Super Bowl moments within the last decade took place. Manning escaped a plethera of Patriots to avoid the sack and threw a prayer to David Tyree who make one of the most ridiculous catches in Super Bowl history, pinning the ball to his helmet for a 32-yard gain. Manning would hit Plaxico Burress for a 13-yard touchdown with just over 30 seconds remaining in the game. The Giants went onto win to a score by a score of 17-14. The aftermath of this crazy game was the Giants beating New England again four years later with Eli Manning winning his second Super Bowl MVP. Those two Super Bowl wins provided Eli Manning a decent Hall of Fame resume and labeled him a Patriot killer, handing Tom Brady his first two Super Bowl losses. David Tyree became known for his helmet catch and Justin Timberlake even did a skit for the ESPY’s featuring the pop star putting a piece of gum on his helmet before the play. David Tyree’s career after his improbable catch featured only a few more catches, but Giants’ fans will always remember his play in the Super Bowl XLII. The Steelers were going for their second championship in four years. They featured Mike Tomlin in his first year as head coach with impact players such as Ben Roethlisberger, Hines Ward, Troy Polamalu, and James Harrison. They were taking on Hall of Fame QB Kurt Warner, Larry Fitzgerald, and Edgerrin James as the Cardinals looked for their first championship since 1947. As the Kurt Warner-led offense was about to score before halftime, the Steelers’ James Harrison took an interception 100 yards for a touchdown (longest play in SB history at that time) to take a 17-7 lead into the break. Later in the second half, a Jeff Reed field goal put the Steelers up 20-7, and they looked like they were going to run away with the Lombardi Trophy all the way to Disney World. Just two plays later, Warner threw a touchdown to Larry Fitzgerald, and a holding call on the Steelers gave the Cardinals a safety that made it a 20-16 game with Arizona having possession. Warner proceeded to throw a 64-yard touchdown pass to Larry Fitzgerald with 2:37 left to take a 23-20 lead. In that two minutes and change, Roethlisberger walked down the field and threw a six-yard pass to Santonio Holmes (SB MVP) with a toe-dragging touchdown in the corner of the end zone with 0:35 seconds to go to win the game. The game broke Super Bowl records right and left with only 91 rushing yards combined in the game. Even though it was Kurt Warner’s 3rd 300 yard game in the Super Bowl, it will always get remember for the James Harrison touchdown and Santonio Holmes game-winning TD. As Kurt Warner retired the following season, the Cardinals signed Carson Palmer, but still have not gotten Larry Fitzgerald back to the Super Bowl. As for the Steelers, they made it back two years later, only to lose to the Packers. Even as one of the most dominant teams in the last decade, Roethlisberger and Tomlin have struggled to get by New England. Tom Brady was going for his 4th ring against the “Legion of Boom” and the Seatle Seahawks were going for back-to-back Super Bowls after beating the Denver Broncos 43-8 in the previous Super Bowl. Tom Brady with Rob Gronkowski, Patrick Chung, and Vince Wilfork faced off against emerging star Russell Wilson, Marshawn Lynch, and a star powered defense led by Bobby Wagner and the “Legion of Boom”. The game was tied 14-14 going into halftime, showing the equal levels of talent between the two teams. Seattle took a 24-14 lead into the 4th quarter, looking to win back-to-back championships. Then Tom Brady flipped a switch, hitting Danny Amendola and Julian Edelman for touchdowns giving the Pats a 28-24 lead with 2:02 left, giving Wilson and the Seahawks one last chance. With Seattle driving down the field, Jermaine Kearse made a circus catch for a 33-yard gain to NE five-yard line and a Lynch run got them to the one-yard line with 0:26 seconds left on the clock. Everyone and their cousin were convinced Pete Carroll would hand the ball to their bell cow in Marshawn Lynch, but Wilson tried to throw a slant route to win it all. Rookie reserve corner Malcolm Butler had other ideas, jumping the route and intercepting it on the 1-yard line. New England still needed to run a play since a kneel would be in the end zone for a safety. Michael Bennett became impatient and jumped offside giving New England an extra five yards and some breathing room. After a Brady kneel down, Seattle used their last timeout and Seahawks’s lineman Bruce Irvin started a brawl with the Patriots and ended up getting ejected for throwing a punch at Gronkowski (first player in Super Bowl history to get ejected). Brady took another knee and celebrated his 4th Super Bowl. New England makes it back to the big game just two years later to complete yet another comeback, this time against the Atlanta Falcons after being down 28-3 at one point and winning 34-28 in OT. Pete Carroll and the Seahawks received backlash months after the big game for not running the ball on the one-yard line with Marshawn Lynch. After this game, the “Legion of Boom” and the Seattle fell apart and were never the same team. Russell Wilson still leads the Seahawks and look to be contenders again next season, but we will have to wait and see what they do next. However, this game will always be remembered as the game Seattle should have run the ball, as well as another ring for Brady and failure by the “Legion of Boom” to go back-to-back. There are a couple other Super Bowls that should be mentioned, as it was a hard decision to keep these two off of the list. Their have been great Super Bowls and also Super Bowls that we remember for the wrong reasons, howver, we should appreciate these two great games as well. This was the “Harbaugh bowl” as John Harbaugh took on his brother Jim Harbaugh. The Ravens were led by Joe Flacco (who led an incredible playoff run), Ray Rice, and a star-powered defense led by Ray Lewis, Ed Reed, and Terrell Suggs. The 49ers came in with their new read-option offense, as Colin Kaepernick and Frank Gore made it to San Francisco’s first Super Bowl since the Joe Montana/Steve Young eras. 49ers also had an aged Randy Moss, Michael Crabtree, Vernon Davis, as well as a strong defense with Patrick Willis and Navarro Bowman. Baltimore’s Jacoby Jones returned a kick 108 yards for a touchdown to start the second half, putting the Ravens up 28-6 (longest play in SB history). It looked like the Ravens were going to blow out the 49ers until a power outage hit with 13:22 left in the third quarter. The power outage lasted for 34 minutes making the game go for 4 hours and 14 minutes, the longest game in SB history. The blackout ignited the 49ers with a Kaepernick passing touchdown, a Frank Gore rushing touchdown, and a David Akers field goal to make it a 28-23 game entering the fourth. A Justin Tucker field goal put the Ravens up by nine, but Kaepernick answered with a 15-yard touchdown run (longest for a QB in SB) and a failed two-point conversion attempt still meant the Ravens had a two-point lead. Another Justin Tucker field goal with 4:16 left gave Kaepernick and the 49ers a chance to win with a touchdown. But with 1:46 to go, the 49ers turned the ball over on downs, allowing the Ravens to run out the clock out and take a safety with 0:04 seconds, securing the Super Bowl win. 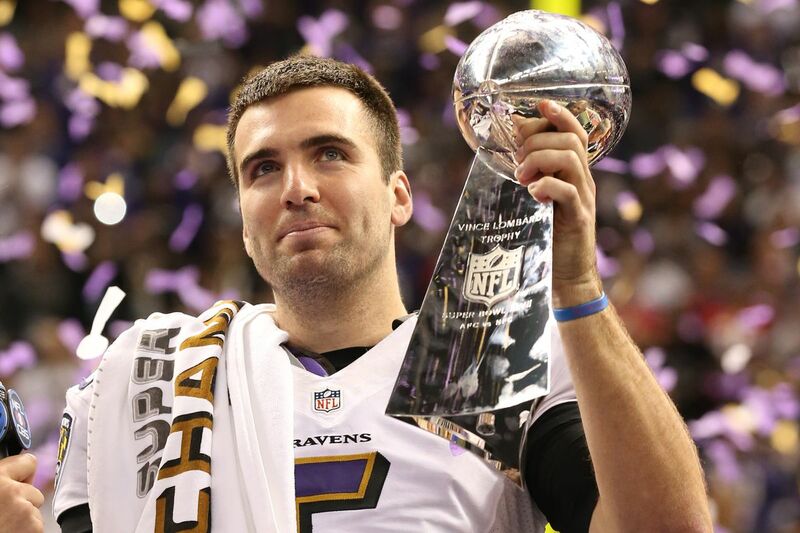 The Ravens gave Joe Flacco a new massive contract after being named Super Bowl MVP, but have failed to make it back to the big game since. The 49ers franchise fell apart after this game, setting them back immensely. Jim Harbaugh left to be the head coach for his for his alma mater at the University of Michigan. This game is important not only for the blackout, and but for how a 49er comeback win could’ve reshaped the NFL. A win may have led Jim Harbaugh to stay as head coach and Colin Kaepernick may have emerged into the NFL star that he was during their playoff run. For the Ravens, Joe Flacco wouldn’t have had gotten such a massive contract, giving the Ravens more flexibility to add pieces. Even though Ravens fans will remember Joe Flacco’s Super Bowl run and the 49ers will be remember “what if” scenarios, the everyday fans will never forget the “Blackout Bowl” and “Brother Bowl” as an all-time classic. I’m sorry Vikings fans, but even without the purple and gold this went down as a phenomenal Super Bowl. After a couple of devastating years recovering from Hurricane Katrina, the city of New Orleans needed something to lifts their spirits and Drew Brees, Reggie Bush, and a Jonathan Vilma-led defense brought something the city will never forget. The Indianapolis Colts were led by Peyton Manning, Reggie Wayne, and Dwight Freeney, and were going for their second title in four years. A matchup between two future Hall of Fame QBs, this game was a given to be great and it delivered. The Colts came ready to play, up 10-0 at the end of the first quarter. The Saints hit a couple of field goals before halftime to make the score 10-6 going into the break. To start the second half, the Saints decided to onside kick and they recovered it, making it the first successful onside kick before the 4th in Super Bowl. A Jeremy Shockey touchdown and a successful two-point conversion put the Saints up 24-17. Later Manning and the Colts were driving in the red zone, but Tracey Porter picked him off and went 74 yards to the end zone to make it a 31-17 game with 3:12 to go. With two great QBs, you knew there would be a lot of passing, and boy was there ever. Drew Brees was the named the Super Bowl MVP, completing 82.1% of his passes. Combined, both teams totaled 63 completions and only 37 rushing attempts. There was also only one sack and one turnover in the game, which are are both records. Peyton Manning tried to make it back one more time with the Colts before he was released, but ended up in Denver (making it to the Super Bowl two more times, winning one ring in Super Bowl 50 and then retiring). The Colts, following Manning’s release, struggled the following season and then drafted Andrew Luck with the 1st pick in the 2011 NFL Draft. The Saints have had a successful tenure with Brees and company, but with the Minneapolis Miracle and the questionable no-call against the Rams this past season, Drew Brees’ time is running out. The Colts will remember this game as Hall of Fame QB Peyton Manning’s last chance with their franchise, and the city of New Orleans will never forget this game after Hurricane Katrina.